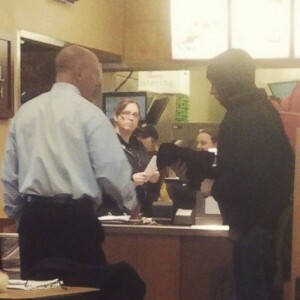 BIRMINGHAM, Ala. — A Chick-fil-A owner in Alabama is making headlines after he was captured on camera helping a presumed homeless man by giving him a free meal, and then handing him his very own gloves. An unidentified man walked into the Birmingham-area Chick-fil-A last week and asked owner Mark Meadows if he could work for food. Although Meadows was unsure as to whether the man was homeless, he said that it appeared so as he was carrying a number of garbage bags, most likely filled with his personal possessions. “We made eye contact and I asked him what would he like, what we could do for him and then he asked if he could do some work to get something to eat,” Meadows told ABC News. But instead of putting the man to work, he told him to have a seat and that he would provide him with a free meal on the house. As the man waited for his meal, Meadows noticed that he was rubbing his hands together. So, he asked him if he had any gloves. The man said no. “I said, ‘Take my gloves,’ and when I went and got them … he was kind of taken aback, like he didn’t want to take them,” Meadows recalled. But the man eventually received the gift along with a free meal, and went on his way. But while Meadows would have let the incident go without applause or fanfare, one customer who witnessed his act of kindness decided to take a photograph and post it to Facebook. “There is still so much good in this world and I’m so grateful that Bryson saw it all unfold,” she continued. Owner Mark Meadows also made headlines last year when he and his employees gave out free food to hundreds of drivers stuck in traffic for several hours during a snowstorm. Chick-fil-A also offered motorists a place to stay for the night as one of the local hotels was filling up. Meadows himself spent the night at the store.